Researchers at the University of Cincinnati received a grant of $600,000 from the National Association of Chain Drug Stores Foundation for a program to lower hospital re-admissions and improve the quality of community healthcare. Getting discharged from the hospital and then having to go right back in again can be emotionally draining for a patient and their family. Approximately 2.6 million seniors discharged from a hospital are readmitted within 30 days at a cost of over 26 billion from American taxpayers annually. Researchers at the University of Cincinnati found that re-admissions could be lowered at a rate of at least 20%, if high-risk patients received counseling and medication management from a pharmacist in a community pharmacy. Hospitals and pharmacies do not have an efficient and accurate way to communicate, and a lot of miscommunication happened after a patient was discharged. For those patients, medications are often discontinued, added, or changed during their hospital stay and many patients do not fully understand the directions they receive upon discharge. It is very helpful to review discharge instructions with patients a few days after discharge at the community pharmacy to help them understand all the changes that were made. Researchers at the University of Cincinnati hope to be able to impact more patients on a larger scale and improve the quality of healthcare in Cincinnati. Numerous programs across the university are nationally ranked. Those research programs at the University of Cincinnati help attract more than $500 million in research funding from both federal and private supports each year. In 2013, the University of Cincinnati received more than $65 million in research funds from the National Institutes of Health and more than $27 million in 2014. The University of Cincinnati is also a friendly professional laboratory supply marketplace. 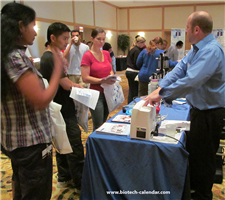 Biotechnology Calendar, Inc. is providing an excellent opportunity for laboratory supply companies to get connected with such a richly funded research market at the 13th Annual BioResearch Product Faire™ Event at the University of Cincinnati on August 6th 2014. 36 were purchasing agents, professors and post docs. Attendees came from 23 different research buildings and 27 on-campus departments. If you are a laboratory supply company and would like to exhibit at the BioResearch Product Faire™ Event at the University of Cincinnati on August 6th 2014, please click the button below for more information about the event. Biotechnology Calendar, Inc. has been producing on-campus tradeshows for more than 20 years. Each year we hold more than 60 BioResearch Product Faire™ Events at different institutes across the nation. Please read: National Show Schedule for 2014.